Apparently I am not meant to do anything but stay home with children. All three should be suffering through full days of school now, but the first couple of weeks have been full of speed bumps. All three went to school on the first day and evidently dipped their hands and heads right into the giant vat of germs and bacteria that I think every school must have. Aliza was sick a day and a half last week. This week, Zack has stayed home Monday and Tuesday. AJ has been doing splendidly. He loves being there and they are thrilled will how much more he is talking. This is also the first time the boys have had a meal at school, and neither one is really eating lunch. I am trying to decide at what point I intervene. At what point do I say, "Let them eat in the autism room - so they will at least eat something!?" By the end of the week they were munching on a little cereal in the cafeteria, but still not touching their sandwiches. That's another thing -- peanut butter and jelly sandwiches are about all I can make them for lunch. There's nothing else they eat that I could easily pack in a bag and let sit all morning. I guess it's going to be PBJs for them every single day. Zack has been sad. On Friday, the notes from school say "Today's Zack's preferred activity was to sit in a chair in the choice time area and look out the window. It was SO unusual, he sat almost completely still. A few separate occasions he started to cry quietly and looked very homesick. He required lots of redirection to distract him from feeling the blues today." My poor boy. He's having a very tough time adjusting to the long days. We have a ton more language than we did a year ago, but they're not exactly conversational. It would be nice if, when they are sick, they could give me a couple of specifics. In happier news, this past weekend we took the boys to the Burnsville Firemuster parade - see here for details from last year's parade adventure. They are way, way too big for the stroller, but they feel secure sitting in it, so I don't dare get rid of it. Almost smacked Grandma with that flag. They don't look too thrilled to be there, but they didn't struggle to get away and repeatedly say "go home?" so I consider it a huge step forward! This year they actually sat and watched the whole thing. Well, they watched most of it. One other great benefit of this stroller is the way you can hide from the world in it. Aliza got to scratch off something on her bucket list ("Things I Want to Do Before Middle School"). 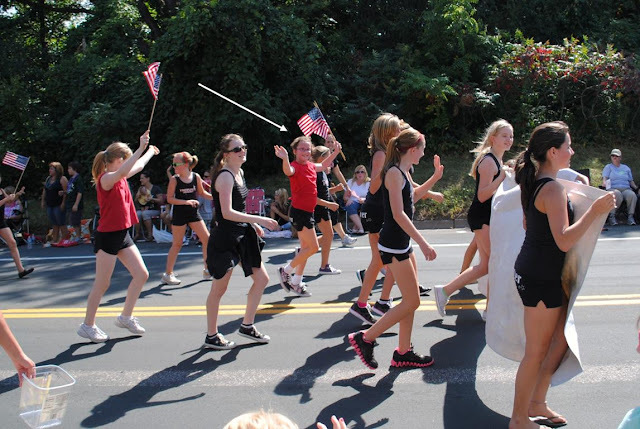 She walked in the parade with her dance team. Hoping Zack's nose clears up enough for him to go to school tomorrow..... today he's going to be watching a lot of Little Einsteins and doing puzzles and fun folders.